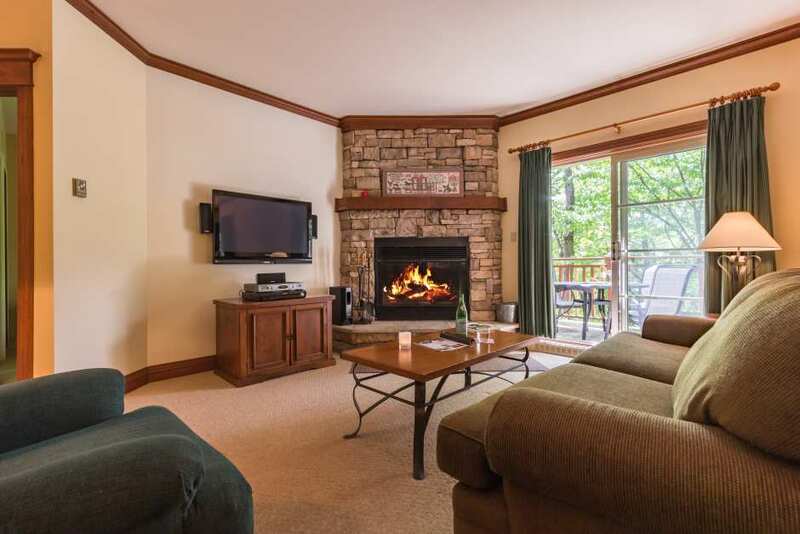 This charming two-bedroom, two-bathroom property is ideally located to ensure a pleasant stay in Mont-Tremblant. As soon as you walk in, you’ll love the open space with wood trim and beautiful fireplace. The kitchen is well designed to make it easy to work together cooking fancy meals or quick snacks. In summer, the balcony with barbecue is a great spot to relax with a drink or enjoy a meal. The ample windows create a bright ambiance. The master suite is equipped with a comfy queen-size bed, plasma TV and private bathroom with whirlpool bath. The second bedroom has two twin beds and adresser. The tile flooring is heated. In the living room, an HDTV with DVD player, an iPod-compatible sound system and wireless access to high-speed internet will meet your entertainment needs.